The existence of a female pope has been postulated by numerous modern scientists. They have collected extensive evidence to support this thesis. In addition to the work by Martin von Troppau listed on the start page, these are essentially the documents by Friedrich Spanheim, the official Liber Pontificalis of the 9th century, the report by the chronicler Conrad Botho and a letter from Anastasius to Pope John. Furthermore, certain objects are of great interest: In the Lateran there were two stone armchairs with a hole in the seat (today in the Vatican Museum). Coins with monograms from the period in question are also informative. A statement by Jan Hus before the Council in Constance in 1413 should also be mentioned. Martinus Polonius (ca. 1220/1230 until after 22 June 1278) is also called Martin Polonius (after his origin). The Dominican wrote the most widely used Latin chronicle of the Middle Ages. In his report he writes of a pope who is said to have been a woman. 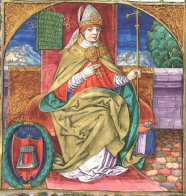 John Anglicus, born at Mainz, was Pope for two years, seven months and four days, and died in Rome, after which there was a vacancy in the Papacy of one month. It is claimed that this John was a woman. The 1277 report triggered a flood of further reports and heated debates. They began in the Middle Ages and continue to this day. Friedrich Spanheim Friedrich Spanheim (1632-1701) was a Protestant theologian and church historian. Born in Geneva, he taught in Heidelberg and finally in Leiden (NL). He reports about a letter to the librarian Anastasius (died 879). The letter can no longer be found today - lost or destroyed. The document is still attested in 17th century specialist literature. The official Liber Pontificalis of the 9th century also contains slightly hidden evidence. It is preserved only by later copies. In this book of popes the biographies of the popes are collected chronologically. The earliest copy dates from the 11th century, well before Martin von Troppau's report. On the one hand the description of the life of Pope Leo IV abruptly breaks off, it reaches only up to approx. 853. Not even the last word was finished. The rest of the page remained empty. According to other copies, one would expect the short biography of Pope Benedict III to follow. However, this life report is completely missing. Instead one finds the description of a pope whose name is not mentioned. He is said to have buried his predecessor Benedict III. There are many indications that this "nameless" Pope was John VIII or even the Popess. The theologianJoan Morris assumes that Martin von Troppau had read this manuscript. Because of the erasures he could no longer safely classify the pontificate of theBecause of the erasures he could no longer safely classify the pontificate of the «nameless Pope». He put it directly after Leo IV. Since then most scientists follow this assumption. Today other sources are known which show that this assumption cannot be true. The chronicler Conrad Botho (second half 15th century) reports about the coronation of the Carolingian emperor in Rome. According to these records, Pope John VIII crowned the Carolingian Emperor sacred in 856. The name of the emperor: Ludwig II, also called Ludwig the German, who reigned since 855. Botho does not seem to have known that he was describing the Popeess, because he does not mention that the Pope was a woman. His report is correct if her pontificateis set for the years 856 to 858. If one follows the official pope list, Benedict III would be pope in this period, which stands in contradiction to the documented information. Anastasius was a priest in Rome with an eventful career. He was a cardinal priest, was excommunicated, competed with the later Benedict III for the papal throne, was for a short time counter-pope. Finally he entered into ecclesiastical ministries again, became Abbot (after 858) and was promoted to Pope Hadrian II Librarian. There is a letter from him to Pope John - who probably was a woman. Due to the title of Anastasius, the letter can be dated to the time before 858, long before he became a librarian. Between 855 and 858 - the time of the presumed pontificate of Popess Joan - he signed with "Exiguus", only from 867 with «Bibliothecarius». The letter seems to prove the existence of John Anglicus in the years before 858. This letter deals with the synod of 794. This synod was still eminently important for the Frankish Empire in the 850s. If, on the other hand, the official dating of the letter is in 870-880s - what those who deny the historical reality of a woman as pope deny - this makes little sense. Details on the page Pontificates. Although in this time the later John VIII was head of the church, the content would be completely outdated: On the one hand the titulature of Anastasius would be inappropriate because it was outdated, on the other hand the Frankish Empire was in this later time in the definitive dissolution. In the Lateran there were two stone seats, each with a hole in the seat (today in the Vatican Museum). 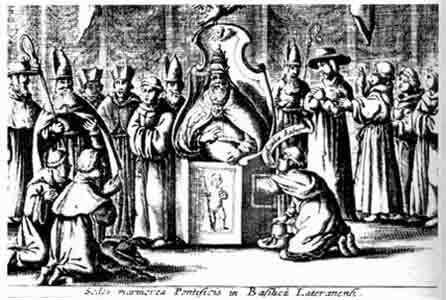 The illustration on the right shows the examination of a pope according to his choice. The youngest Cardinal had the task of verifying the masculinity of the new pastor. With this ritual a further mishap with a disguised woman should probably be prevented. At the time in question, the popes also issued coins of the Papal State. As a rule, they were so-called combination coins. On these the monogram of the pope as well as the name of the reigning Carolingian emperor was noted. 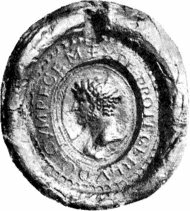 This coin shows on the obverse the monogram of a Pope IOHANIS mwith artistically combined letters. On the outside the stroke SCS PETRUS. The centre of the back is filled with the frequently used monogram ROMA. On the outside the lettering LVDOVVICUS IMP. Louis II was crowned Carolingian Emperor by the Pope in 855 and reigned until 876. 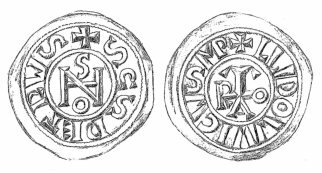 Numismatics and other sources indicate that John Anglicus and Popess Joan had begun her pontificate AFTER Benedict III as John VIII. The description of the unnamed pope in the Liber Pontificalis can only be explained in this way, because it reports about the deacon John, the closest co-worker of Pope Benedict III. After his death the people of Rome elected the deacon John as the new pope. This deacon John was probably a woman in disguise, just Johanna. More detailed information can be found in the biography. Jan Hus (ca. 1370-1415) was a Bohemian theologian and reformer. He described the Bible as the highest authority in matters of faith and thus questioned the Pope's position. Therefore he was taken to court at the Council of Constance. Reports by chroniclers, letters and coins were carefully examined and correlations were worked out. Manipulation in documents indicate that a Pope John must have existed in the 850s. Would a male pope have been so consistently erased from the documents? More obvious is that this Pope was John Anglicus, who called himself John VIII and was in fact a woman - the Popess.